The Lyndhurst estate in Tarrytown, New York (Collinwood in the 1970s Dark Shadows spin-off movies) is hosting some special events this month. Lyndhurst After Dark is a series of nighttime tours with a Dark Shadows theme, raising vital funds for the upkeep of the house. In addition to special exhibits and atmospheric live music, actors Sharon Smyth (Sarah Collins) and Jim Fyfe (1991 Willie Loomis) will be appearing as guests on October 20 and October 27 respectively. For more information, click here. Newport, Rhode Island's Seaview Terrace, the original exterior location of Collinwood, is to host a special ballet version of Bram Stoker's Dracula, taking place from October 17-21. For more information and to reserve tickets online, click here. Actress Marie Wallace (Eve) is appearing on stage throughout October in The Last Romance. The production runs from October 18 to November 11 at the Seven Angels Theatre in Waterbury, Connecticut. The will also be a cast party on October 20. For more information and to book tickets online, click here. 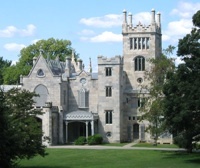 And finally, the Lockwood-Mathews Mansion, the Norwalk, Connecticut property which featured in the finale of House of Dark Shadows, is holding a Halloween Party on October 27, featuring spooky decor and music. Places are limited and ticket information can be found by clicking here. YES, this is the Collins Family Estate on the Classic DARK SHADOWS. I spelled it wrong in a previous comment post above: so it's the Lyndhurst Mansion it's incrediable and nice to know it still stands and how wonderful they give Tours & that the Classic DS's Sarah/Sharon Smyth and 1991-Willie/Jim F. (love that DS's too!!) give the Tour. I bet that was a treasure being in their presence.